Greetings! My name is Amy MacKinnon and I’m a web developer, thespian, and mother. I was born and raised in the San Francisco Bay Area, but have also lived in Idaho, Colorado, and Virginia before returning home. I’ve worked in a few different fields and as Xena would say, "I have many skills." My greatest passion in life is theatre, followed by computers & technology. I have two young daughters who take up most of my freetime but I still make time to pursue my interests. 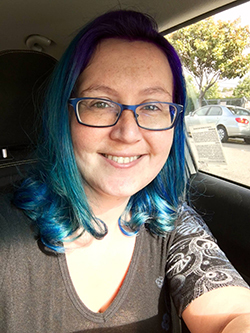 Other interests and hobbies include: baking pies, taking care of my cats, reading, crocheting/knitting, playing games, performing theatre, seeing theatre, playing piano, tap dancing, and more that keep my time quite filled. I'm extremely fascinated by just about everything out there in the world. This website highlights only a small part of my adventures.